Pull off the roadway to a safe place and stop driving. 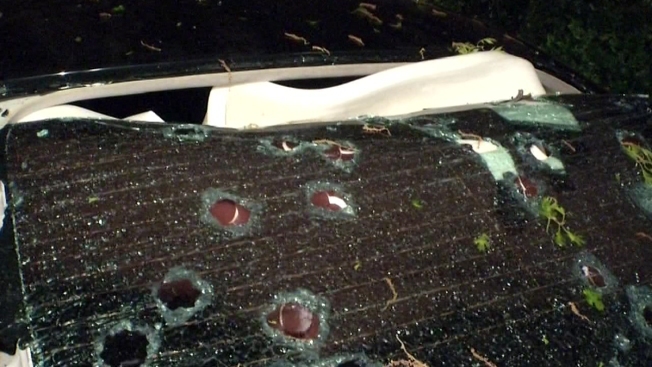 Hail can break you vehicle’s windows and the resulting broken glass can harm you. Continuing to drive only compounds the speed of the hail hitting your car, increasing the damage. In addition, strong winds may push debris such as tree limbs, trash, or even power lines, onto the roadway in your path. Heavy rains and hail limit visibility that can cause flash flooding and hydroplaning, which make roadways difficult to navigate. If possible, find a sheltered place like a car wash, a bank drive through, a gas station canopy, or similar structure that may protect you. DO NOT stop under a bridge. The shoulder of the roadway will quickly fill with vehicles and become a hazard for other motorists who may not see your car. In addition, bridge underpasses amplify the strength of winds passing under them. Stay inside your car. Hail can be large and it falls at dangerous speeds. Your car might get dented, but unlike you, the car will not suffer a concussion or other serious injuries. If you cannot find suitable overhead shelter, pull completely off the roadway, lie down, and cover your head. Remember it’s better to arrive late, than not at all! Be Weather Aware!